Cherry wood enhances the color of your meat. Can't decide on just one type? Get an assorted case of chips and chunks. 12 and 16-inch logs are available. Shipped directly to you from the heart of Missouri. 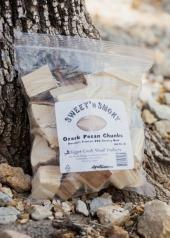 All logs, chunks, and chips are neatly packaged and prepared for shipment to anywhere in America or abroad from the heart of Missouri. We have been a family-owned business for over 20 years and we work hard for our customers, so you’ll get the wood you need delivered on time with the best shipping rates possible. From the backyard barbeque to the commercial distributor, your business is appreciated, and satisfaction is guaranteed. Call 660-385-3800 or email sales@chiggercreek.com today for pricing or to place an order and discover the difference we can make for you!